Prickly and Bitter: Stop touching me! 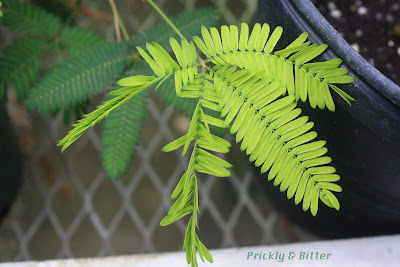 The sensitive plant is native to Central and South America, where it is so common you might mistake it for grass in some areas if you're not paying attention. It has been introduced to other continents around the world, and it has become invasive in Australia, South Africa, Tanzania, and many islands in the South Pacific (along with other continental countries in Asia). It has also been introduced to many countries other than just South Africa and Tanzania in Africa, but it does not seem to become invasive there. When I was in Panama, the hotel I was staying at looked out over the Chagres River (the main river feeding the Panama Canal), and between the hotel and the river was a big flood-plain covered in what I thought was grass. I went and took a walk one day and you could literally see where I had wandered around, since all of the leaves were closing behind me as I walked. It was a neat experience! 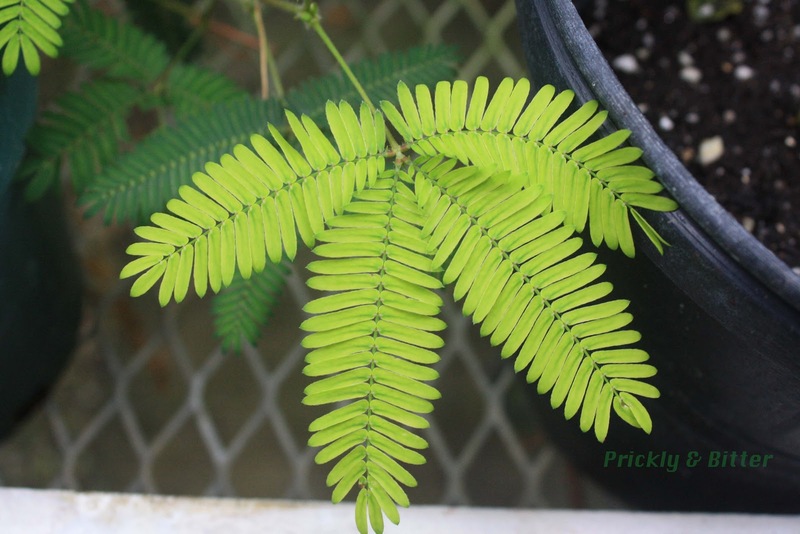 The sensitive plant is called the sensitive plant for a reason; it is sensitive to light, temperature, electrical charge, and touch. It is not just a common garden plant in some areas for these reasons; it has become one of the most widely sold tropical indoor plant species in recent years. 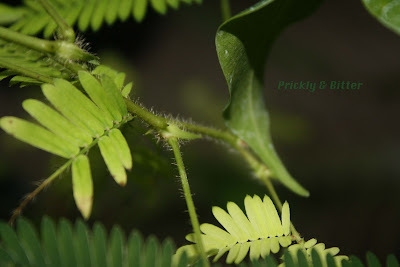 When touched, the leaves of the plant very quickly close; the difference in time between the photo with the leaflets fully open and them fully closed was only a few seconds. After a couple of minutes the leaves open back up again. This is accomplished through the rapid movement of water out (in the case of the leaflets closing) or in (in the case of the leaflets opening again) to the plant cells. The plants, like animals for generating never impulses which result in movement of muscles, have the ability to rapidly pump potassium ions into the the spaces between cells, causing a change in osmolarity of the cells. Normally the osmolarity of the cell is slightly higher than the osmolarity of the space outside the cells; this ensures water is constantly being diffused into the cell, keeping it turgid (which would result in crisp lettuce instead of floppy, gross lettuce). When potassium is pumped into the spaces between cells, water moves across the cell membrane and the cell wall into the intercellular spaces to try to equalize the osmotic pressure. This causes water to escape rapidly from the cells, the cells collapse, and the leaflets close. Once the potassium is gradually cleared away from the intercellular spaces, the water is free to diffuse back into the cells, and the leaflets gradually open back up again. Being able to open and close your leaves is a great response to have, but only if you can use it properly and with purpose. Pumping potassium into a space that usually has very little takes quite a bit of energy, and using all this energy for no reason probably isn't smart if you want to survive. So what would possess a plant to close its leaves in response to touch? What would the point of that be? Well, you can see some clues in the bottom photograph. The varieties of plants grown in greenhouses for sale as tropical indoor plants have been bred to have lost their spines. 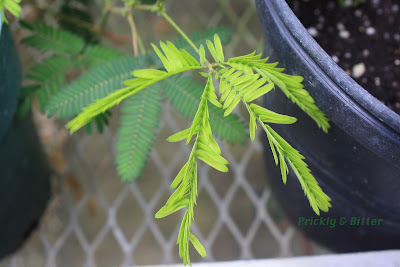 Wild varieties of the sensitive plant have tiny spines all along the underside of their leaves, and all along the petiole of the leaf. When the leaflets close, they expose these spines to whatever has cause the leaf closure, and this is hopefully an effective defence for the plant. Normally this works well; the sensitive plant has become so abundant in pastures because cows refuse to eat it (the spines mixed with the fact that it is mildly irritating to the gastrointestinal system of cows, sheep, horses and pigs) and insects stay away from it. 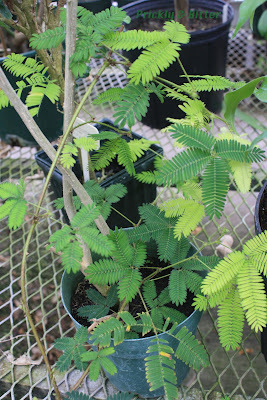 When I was walking through the Mimosa field, I was happy I was wearing shoes! My toes would have been very unhappy if I wasn't. The sensitive plant was once planted on purpose in areas of Africa, Asia and Australia (and the reason why it has become so invasive). Because it is part of the bean or legume family, it has nitrogen-fixing bacteria nodules along its roots. These nodules, containing the bacterium Rhizobium, convert atmospheric nitrogen (a form of nitrogen plants cannot use) into a biologically-active form of nitrogen. This is great for agriculture soils, since traditional crops like corn, wheat and rice all deplete the soil of nitrogen very quickly. If you can rotate your crops with a legume, you can put the nitrogen back into the soil for the next growing season. When the plant has the ability to escape and grow in the wild on their own, and has no known herbivores that will target it, it becomes dangerous to the environment. 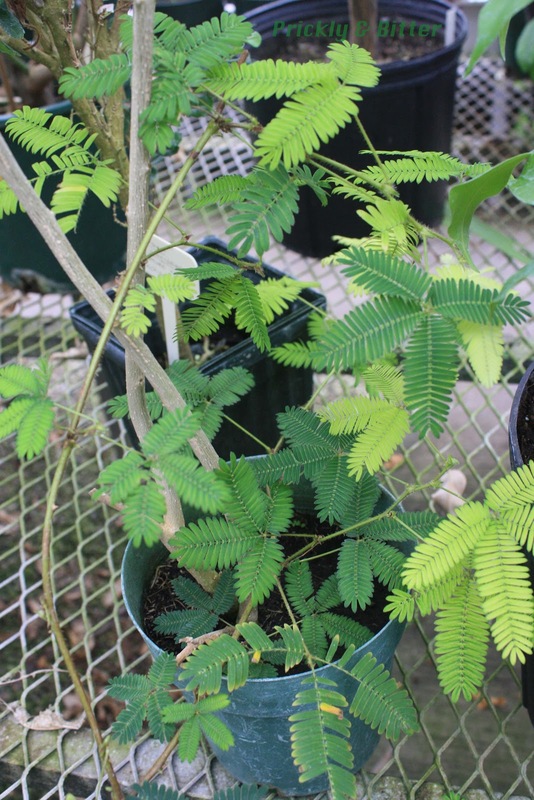 Eradication programs are now in place in Australia, where the sensitive plant has become especially problematic. The toxin in the leaves of this plant, called mimosine (an alkaloid), is toxic to a few species of insects and so has been looked at in recent years as a natural insecticide. I'm not sure where the research stands on this, but it is produced in such small quantities in the plant that a method of synthesizing mimosine in the lab would have to be accomplished before it had any real industrial applications. Extracts from the leaves containing mimosine have also been shown to be a natural anti-venom to the deadly toxic monocled cobra snake, and so there may also be a medicinal application for this plant.